The British Gazette » Sabotaging Brexit – continued: Long Term Gain For Short Term Pain? A British Gazette reader recently made some criticisms. Among them were the small size of the font, but the strongest criticism was the length of some of the articles. Insofar as the font size is concerned, we can advise readers that at some point possibly in the not too far distant future, what is known as the “Wordpress theme” will be updated and/or replaced and an increase in font size could follow. Up to that time we would suggest to those readers with eyesight problems to copy and paste the text of the article into something like Microsoft Word on you own PC and select a larger font size. As for the length of the articles, we are sorry but; No can do! You see the problem is that so much of the issues that are classed as “current affairs” are in and of themselves highly complex and detailed. A proper examination of the issues requires a lengthy article. Indeed we would suggest that this particular reader has highlighted a particular problem with what is now called the mainstream media (MSM). The people who run these organisations are well aware of the limited attention span of the average man or woman in the street and accordingly precis what they want to convey in shortened texts – which cuts out huge amounts of detail and leaves the reader uninformed. The FACT of the matter is this: The UK’s membership of the EU is an incredibly complex thing and any sensible informed analysis of the issues is by definition, long and detailed. Today’s article, as can be seen by the reuse of the image of Dame Angelina, is a continuation of the analysis of the predicament the UK is in. Today, we consider further the whys and wherefores of those entities and persons associated with same MIGHT be hoping that the UK will indeed suffer a “train crash Brexit”. Yesterday we explained why these entities and persons MIGHT be desirous of having the UK remain or re-enter a more integrated and federalist EU. These reasons have been articulated most eloquently and forcefully on many many occasions by Mr Nigel Farage and many other prominent UKIP members! It deserves repetition so herewith it is duly repeated below! Because of the very point Nigel Farage and his colleagues in UKIP have been banging on about for year after year after year! 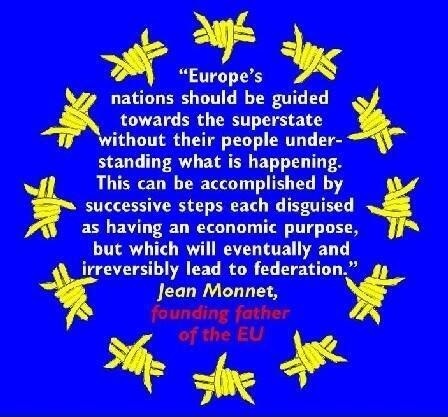 That the EU takes decision making powers from democratically elected legislatures and governments and vests same in the hands of unelected officials! They will know that throughout it’s membership of the what was the European Community, later European Economic Community and eventually, the European Union, the UK was always – and correctly – seen as a brake or a “sea anchor” on what the lead founder Jean Monnet of “le grand projet Européen” wanted: To these certain entities and persons this reduction in the power of democratic governments MIGHT be seen as a good thing as they MIGHT be desirous of a centralised federal authority enable to enact unpopular policies of austerity and public sector debt reduction to create a stable currency and a stable economy across the entirety of Europe! 1. The relatively high level of Euroscepticism in the UK when compared with other EU members. 2. The continued existence of Sterling. The Euro is now a central pillar of the EU. Indeed it can be called the central pillar supporting the keystone. If the Euro were to collapse the EU would collapse along with it! They know that were the UK to join the Eurozone the disappearance of Sterling – but the continued existence of the City of London as a major financial centre would greatly strengthen the Eurozone and thus make the future prospects of the Euro more secure. 1. IF a train crash Brexit takes place the economic and political consequences will be profound and immediate. Today’s post (http://eureferendum.com/blogview.aspx?blogno=86605) by Dr. North demonstrates that IF Article 50 does mean that the UK will not continue to be in the EEA on 30th March 2019 and of course the Customs Union, the situation MIGHT be even worse than had previously been feared! 2. That IF the consequences are as severe as Dr. North fears then the rapid collapse of the Tory government will result. 3. Given the monumental economic and transport chaos that would ensue, combined with the continued use of the First Past the Post electoral system the ONE political party that would do well out of the complete collapse of the Tory vote would be the Liberal Democrats. 4. It is very likely that the new government would be a coalition of the Labour and Liberal Democrat parties. 5. It is virtually certain that the EU would put forward an emergency re-entry offer (that would include a requirement to enter the Eurozone) very quickly. 1. Lowering the voting age to 16. 2. Legislating for a second referendum on the acceptance/rejection of the EU’s offer. 7. Were the UK voters to vote for acceptance of the EU’s offer (especially by a significant margin) the inclusion of the UK in the Eurozone would mean that London would become the financial capital of the EU. They would be aware that whilst many Germans may dream of Frankfurt taking London’s place, the FACT that Brexit was such a monumental disaster will have killed British Euroscepticism stone dead. That is not to say the Brits would ALL (many would however) become as enthusiastic as the Germans about the EU, but there would be a widespread acceptance of the new status quo. They would be aware that this combined with the FACT that many EU states are not happy with Germany being the dominant power in Europe would mean that they would welcome London becoming the EU’s financial capital. 8. During the train crash, London property prices would fall – significantly. Following a re-entry into the EU and entry into the Eurozone, London property prices would rapidly return to their pre train crash levels. Those able to buy and sell at the right time could literally make billions!